PT Surveyor Indonesia (Persero) – PTSI is a reputable state-owned company in Indonesia, running business in independent assurance services. Based in Jakarta, PT Surveyor Indonesia (Persero) engaged in Surveying, Verification, Inspection, Certification and Consultancy. PTSI has its business activities focused in 2 business process: Business Process related to Operations and Business Process related to Corporate Policy Establishment. As a state-owned company, PT Surveyor Indonesia (Persero) is majority owned by the Government of Indonesia. At present, the Government of Indonesia holds 85.12% shares in PT Surveyor Indonesia (Persero). 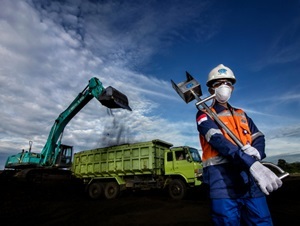 Other remaining shares in PT Surveyor Indonesia (Persero) was owned by Societe Generale de Surveillance SA (10.40%), and PT SUCOFINDO (Persero) (4.48%). At present, PT Surveyor Indonesia (Persero) conducted business operations in all parts of Indonesia under the management of 11 domestic branch offices, 1 Singapore overseas branch offices, 3 UWK offices, 3 representative offices and directly employs 1,581 employees. PT Surveyor Indonesia (Persero) also supported by 2 key subsidiary companies, namely PT Surveyor Carbon Consulting International (99.00%) and PT Synerga Tata International (60.00%). According to information found in PT Surveyor Indonesia (Persero) Annual Report 2016 as cited by JobsCDC.com, PT Surveyor Indonesia (Persero) booked total revenue of Rp848.61 billion in 2016. This total revenue is 0.15% down as compared to the year 2015 amounted to Rp849.86 billion. In year 2016, PT Surveyor Indonesia (Persero) recorded a net profit of Rp89.80 billion or 1.79% decrease from Rp91.44 billion in 2015. Maximum age of 27 years old as of 31 December 2018. S1 graduates from Engineering, Mathematics and Natural Sciences (MIPA), Accounting, Law, Psychology, and Communication. Minimum GPA of 3.00 (scale 4.00). For overseas graduates, it is mandatory to include a GPA conversion from the DIKTI. Willing to be placed in all branch offices and representatives of PT Surveyor Indonesia, both at domestic or overseas. Willing to follow official bonds in accordance with the provisions of PT Surveyor Indonesia.